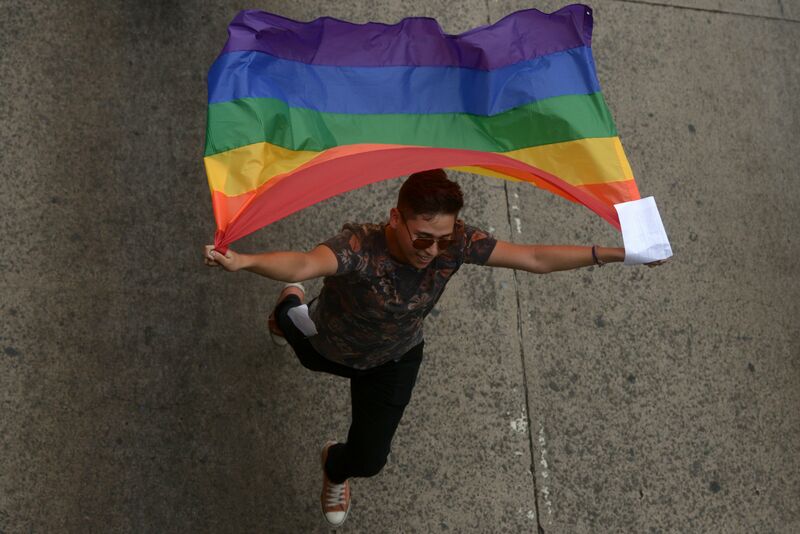 With the country still reeling from the Orlando shooting and all its numerous consequences, cities across the country came together to celebrate their LGBTQ communities, including New York City, which hosts the biggest pride parade in the U.S. The parade began in midtown Manhattan with a moment of silence for the victims of the shooting, and the owner of Pulse nightclub Barbara Poma and the entertainment manager Neema Bahrami rode in the lead float in the parade, accompanied by a group called Scouts for Equality that held up 49 orange and rainbow flags, one for each of the victims. The touching tribute is a reminder to the LGBTQ community of its own immutable strength and a reminder to the rest of the world that pride is here to stay. In addition to the planned tribute by the festival organizers, many parade goers also planned their own tributes to the Orlando victims. A protest group called Gays Against Guns, which was formed just two weeks ago in response to the Orlando shooting, laid down in the middle of the parade route on Fifth Avenue to protest gun control laws. A group of four-year-old boys held a lemonade stand and plan to donate the proceeds to the victims. Sam Bernstein, one of the proprietors of 3 Boys Lemonade, told The New York Times that he opened the stand with his friends Finn Madden and Dean Haines because "because I love selling things and we’re doing it to make persons happy." The tribute is the perfect way of remember the victims and keep alive the spirit of the pride movement. NYC's first pride parade wasn't celebrated under the happiest of circumstances — the Stonewall Riots, as momentous and revolutionary as they were, put over a dozen members of the LGBTQ community in jail and nearly destroyed one of the few safe spaces left in New York at the time. But the year after the riots, when the community came together to hold the first parade, the struggle had fortified and united the LGBTQ community across the country. The Orlando shooting has had a similar silver lining, giving the community a renewed sense of pride and purpose. This year's parade is certainly a bittersweet event, but it's important in times of tragedy to celebrate life. This year, visibility and pride are more important than ever to prove that the LGBTQ community can't be shut down or shut up. Pride parades, especially this year, are a chance to prove to the world that love can't be stopped, and any group of people has the power to change the world.